We’d love your help. Let us know what’s wrong with this preview of Once More Unto the Breach by Meghan Holloway. Rhys Gravenor, Great War veteran and Welsh sheep farmer, arrives in Paris in the midst of the city's liberation For readers of The Nightingale and Beneath a Scarlet Sky comes a gripping historical thriller set against a fully-realized WWII backdrop about the love a father has for his son and the lengths he is willing to go to find him, from a talented new voice in suspense. To ask other readers questions about Once More Unto the Breach, please sign up. I have read a lot of WWII genre books and this is one of the best. I loved the movie the Monument Men so I was intrigued from the very beginning. Also two of my favorite authors Mark Sullivan and Pam Jenoff recommended it. One of my fav For readers of The Nightingale and Beneath a Scarlet Sky comes a gripping historical thriller set against a fully-realized WWII backdrop about the love a father has for his son and the lengths he is willing to go to find him, from a talented new voice in suspense. One of my favorite animal characters ever is in this book,. Truly memorable characters and lots of action. Meghan Holloway’s Once More Unto the Breach is poetic and visceral, lyrical and brutal. A wartime mystery, a family saga, a subtle romance, and an action thriller wrapped up in an epic quest story, this is historical fiction at its best. The tale begins in medias res with Rhys Gravenor, Welsh sheep farmer and Great War veteran, in Paris with a letter in his pocket. The tumult of the liberation is sweeping through France, and Rhys is desperate to find his estranged son. Joined by a young woman who Meghan Holloway’s Once More Unto the Breach is poetic and visceral, lyrical and brutal. A wartime mystery, a family saga, a subtle romance, and an action thriller wrapped up in an epic quest story, this is historical fiction at its best. The tale begins in medias res with Rhys Gravenor, Welsh sheep farmer and Great War veteran, in Paris with a letter in his pocket. The tumult of the liberation is sweeping through France, and Rhys is desperate to find his estranged son. Joined by a young woman who is equal parts fascinating and suspect and by a poodle who is far more than a pampered pet, Rhys finds himself journeying across a desolated, dangerous country. Rhys is a protagonist who is Homeric in character. He is not sad or downtrodden, but there is a poignancy about him. His search for his son runs parallel to another man’s race to do the same. Henri is not what he seems, and his character is a darker echo of Rhys’s. Both men are pragmatic, strong, and capable of great savagery. But Rhys is set apart by his compassion and his humanity. Holloway writes with the cadence of a playwright, and the scenes unfold in such a vividly visual manner that the reader cannot help but be immersed in the character’s perspective. Her writing style is gripping, intelligent, and sophisticated with an impeccable attention to detail and historical authenticity. The cameos of Patton and Klaus Barbie were brilliantly executed. This is a layered story with numerous threads overlapping into one seamless read. Rhys’s harrowing WWI experiences and his evolving relationship with his son are told in flashbacks interspersed throughout the story. Epistolary epigraphs detail his son’s wartime experience in France and provide an overarching timeline of the country’s occupation. The chapters written from the antagonist’s perspective contain some of the most shocking moments in the tale. Holloway’s novel is a breathtaking entry in the historical fiction genre. Once More Unto the Breach is a story of fathers and sons, of the sanctuary of home, of bonds forged in hardship, of atonement and sacrifice. This is a tale that resonates long after the final page is turned. I received a free ARC from NetGalley in exchange for an unbiased review. Once More Unto the Breach reveals an extraordinary tale set in late WWII France. Rhys, a Welshman and WWI veteran, has made his way to France to determine the fate of his son, Owain. Rhys has carried the horrors of his experiences at the Somme for years. His solace, his sense of peace and well-being, are found through hard work on his sheep farm and in his loving family. Both Rhys and Owain are big guys, strong and determine I received a free ARC from NetGalley in exchange for an unbiased review. 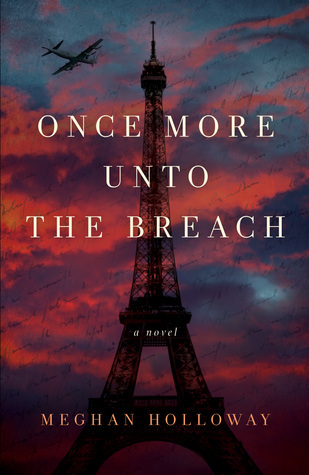 Once More Unto the Breach reveals an extraordinary tale set in late WWII France. Rhys, a Welshman and WWI veteran, has made his way to France to determine the fate of his son, Owain. Rhys has carried the horrors of his experiences at the Somme for years. His solace, his sense of peace and well-being, are found through hard work on his sheep farm and in his loving family. Both Rhys and Owain are big guys, strong and determined, whose physicality distinguishes them from others, yet there is a gentleness about them that belies their strength. With WWII looming, Owain's gentle nature means he cannot take the traditional route of soldier. Angered and embarrassed, Rhys expresses his disappointment with his son so Owain departs for France. That last fight haunts Rhys so after the Normandy invasion he makes his way to France determined to find his son. Holloway employs flashbacks to Rhys's experiences in WWI and there are absolute parallels between the horrors. The way Holloway expresses Rhys's nightmarish experiences force readers to see how little history has taught us. The "war to end all wars" just led to another war. Holloway also expresses some of the story in French or Welsh. What might be awkward actually turns out to be lovely and loving. Although readers may not know the exact translation of every expression or sentence, the emotions of fear, of love, of terror are crystal clear. Once More Unto the Breach was a very powerful and compelling story. It tells the story of how far a father, Rhys, will go to find his son, Owain, in a war torn country. It's story is very fast paced and some scenes where very heartbreaking to read. All characters were very well developed and had their each story to tell. I liked how the author overlapped Rhys' experience in the first war with what was happening in the second one. That even though time had passed between the two wars the emotions Once More Unto the Breach was a very powerful and compelling story. It tells the story of how far a father, Rhys, will go to find his son, Owain, in a war torn country. It's story is very fast paced and some scenes where very heartbreaking to read. All characters were very well developed and had their each story to tell. I liked how the author overlapped Rhys' experience in the first war with what was happening in the second one. That even though time had passed between the two wars the emotions and sacrifices were the same. Great story and I loved the ending! EXCITING AND ACTION PACKED WWII THRILLER!! I HIGHLY recommend this book to any fans of realistic historical fiction, especially WWII era. The main character is Rhys, a Welsh shepherd that has endured much pain and torment in his lifetime. WWI left him scarred and determined never to return to France again. However, in order to find his missing son he returns to France in the midst of WWII. He is aided by an enigmatic woman named Charlotte who has secrets and possible ulterior motives of her own. EXCITING AND ACTION PACKED WWII THRILLER!! This is a wonderful historical thriller set during WWII. It featuresd well drawn characters and a fast paced plot and was atmospheric in setting and time period. I thoroughly enjoyed reading Once More Unto the Breach. It is beautifully written with such detail that you can't help but play the story out in your mind. I love the way the story flows..the ups and downs..the flash backs... Dare I say, my new favorite!!! Definitely a must read. This was very well done. The author has talent. Realistic plot, well-written characters, and a satisfying ending. I can see reasons for the comparison to Scarlet Sky. I look forward to her next book. Recommended. I really appreciate the ARC for review! I wanted to like this, and I didn't hate it. There was some interesting moments. For instance, the character "Rhys", he was actually a very likable character. I really found myself rooting for him to succeed and he had some touching moments on his journey to find his son. As a huger Historical fiction Buff, especially WWII historical fiction, I just found it lacking. I couldn't get my head around this guy traveling across the English channel well before the end of WWII and actually while towns are just being liberated in France. I mean there is no explanation on how ( besides on what) and why he was allowed to just travel basically right after D-day. And then he is just traveling and jumping from town to town and only occasionally running into the German Forces. Now that I am thinking about it, he only runs into Allied forces a few times as well ( American). Again this is a time and place at war in the process of being liberated, and he hops a boat, travels to Paris, and set off on his adventure just so. The Character of Charlotte was basically an afterthought. There is no depth or even real purpose other than to give Rhys someone and something to play off of. Which isn't bad but it was done well at all. She is looking for some piece of art from here Grandmother. Oh yeah she is American that just happened to work at the Lourve in NAZI OCCUPIED FRANCE, well after the declaration of war between the US and Germany. She was just hanging out, under no suspicion from The Nazi forces, Gestapo, or anyone. That just , to me, was a poor detail to leave out or miss altogether in your research. AT the very least she would have been considered an enemy alien at some point,...wouldn't she? I'm not saying they would have locked her up, but I'm sure an American running around as she was would have had more trouble I'm sure. Plus she loses sympathy from me for taking risks to secure Art and do resistance activities for Art, but not the prisoners she drove to the hospital from concentration camps or prison camps. I relieved an ARC from the publisher in exchange for an honest review. This book was compared to Ally he Light we Cannot See and I can see why. However I thought this was much better. I liked the back and forth of the story between the past and the present. I liked the switching of characters at times. And it liked the surprise ending. I would recommend to others. Thank you net galley for the advance reader copy of this novel. I enjoyed this historical fiction centered on the time period just after WWII had ended. A Welsh sheep farmer tracks across France to find his son, Owain. Owain had been part of a resistance group to help save children and a jewish looted art from the Nazis. This novel was a bit slow to start and someone difficult to keep straight but was overall an enjoyable read. I appreciated all the research that went into this novel.